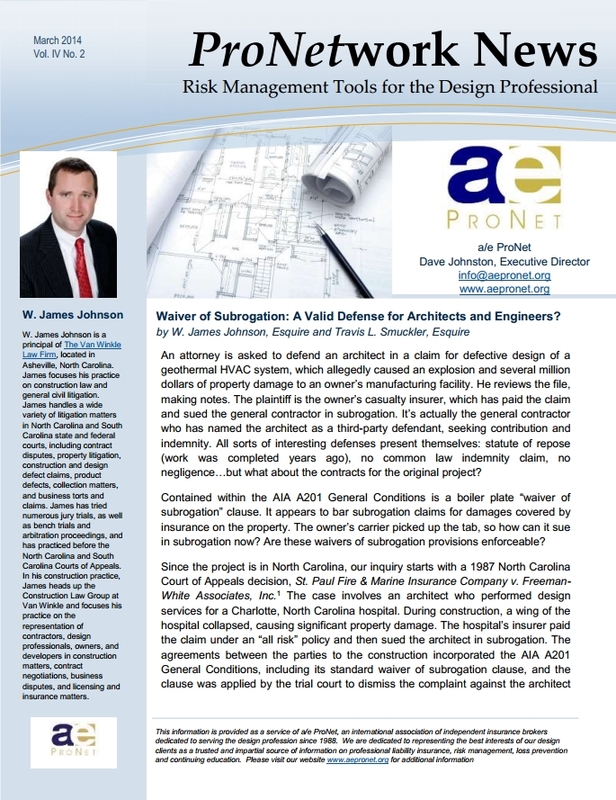 An attorney is asked to defend an architect in a claim for defective design of a geothermal HVAC system, which allegedly caused an explosion and several million dollars of property damage to an owner’s manufacturing facility. He reviews the file, making notes. The plaintiff is the owner’s casualty insurer, which has paid the claim and sued the general contractor in subrogation. It’s actually the general contractor who has named the architect as a third-party defendant, seeking contribution and indemnity. All sorts of interesting defenses present themselves: statute of repose (work was completed years ago), no common law indemnity claim, no negligence…but what about the contracts for the original project? On September 18, 2013, the Securities and Exchange Commission adopted the final rule under the Dodd-Frank Act regarding the registration of municipal advisors. The new rules were published in the Federal Register and became effective on November 20, 2013. 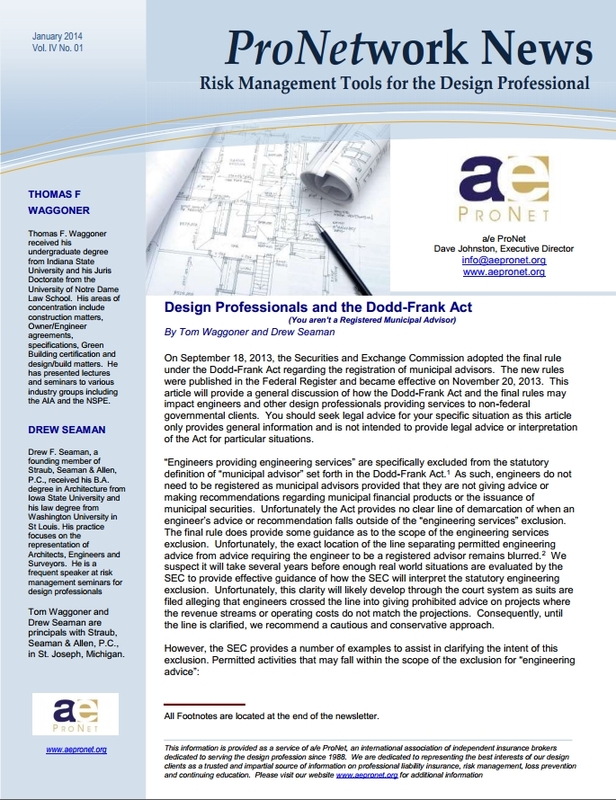 This article will provide a general discussion of how the Dodd-Frank Act and the final rules may impact engineers and other design professionals providing services to non-federal governmental clients. You should seek legal advice for your specific situation as this article only provides general information and is not intended to provide legal advice or interpretation of the Act for particular situations. 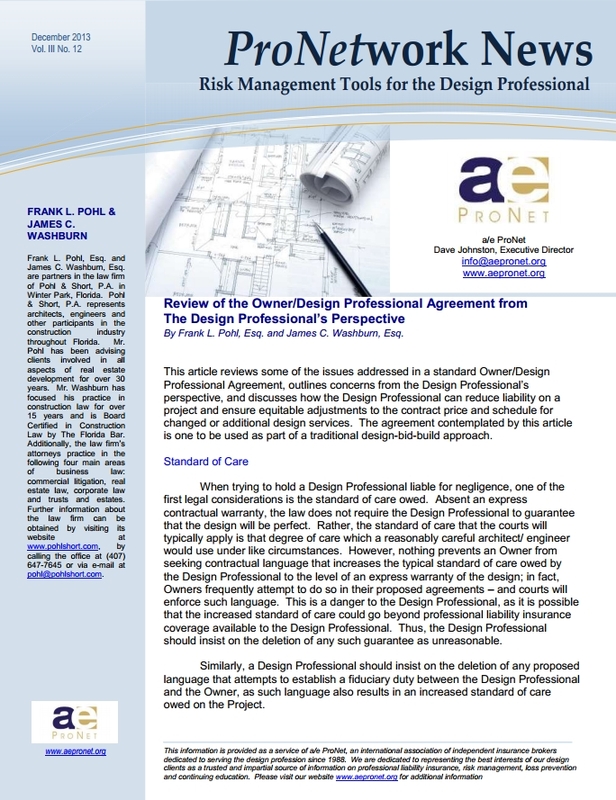 This article reviews some of the issues addressed in a standard Owner/Design Professional Agreement, outlines concerns from the Design Professional’s perspective, and discusses how the Design Professional can reduce liability on a project and ensure equitable adjustments to the contract price and schedule for changed or additional design services. 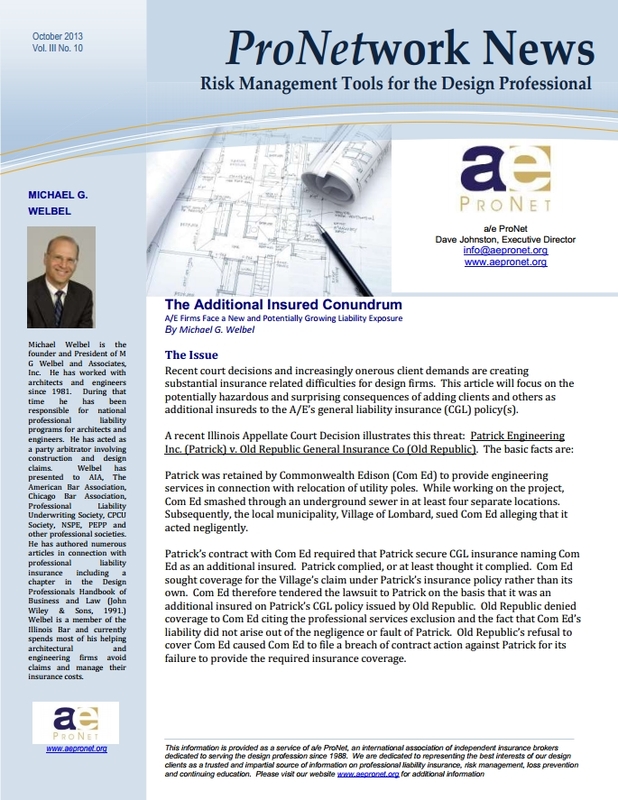 The agreement contemplated by this article is one to be used as part of a traditional design-bid-build approach. 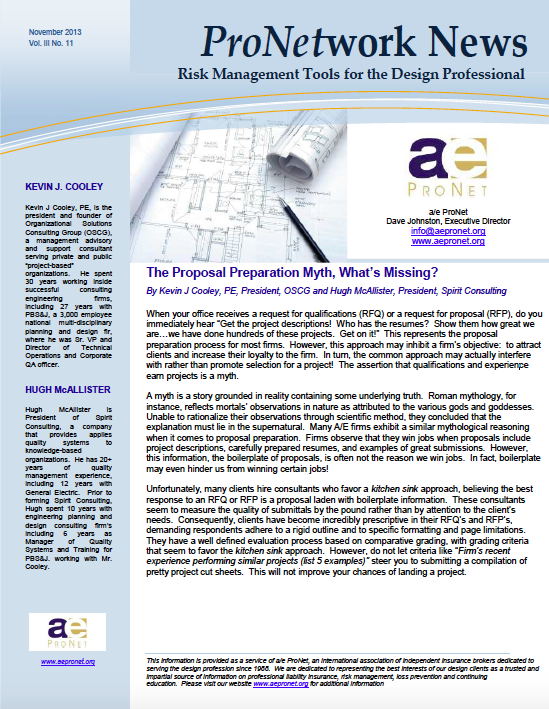 The Proposal Preparation Myth, What’s Missing? When your office receives a request for qualifications (RFQ) or a request for proposal (RFP), do you immediately hear “Get the project descriptions! Who has the resumes? Show them how great we are…we have done hundreds of these projects. Get on it!” This represents the proposal preparation process for most firms. However, this approach may inhibit a firm’s objective: to attract clients and increase their loyalty to the firm. In turn, the common approach may actually interfere with rather than promote selection for a project! The assertion that qualifications and experience earn projects is a myth.